Whatever your Sunday morning tradition, it's important to remember to slow down and enjoy the sweetness of the moment with your loved ones. Sandra Lee, home and food expert, shares simple tips to treat yourself and loved ones to special moments. Caring for the important people in your life is most rewarding when you are relaxed and free to enjoy those special moments. On a bright spring day, open the windows and let the sun's warm rays pour into your kitchen. A sunny morning can lift spirits and set a positive tone for the day. Not sunny? An easy way to get in the Sunday morning spirit is to take a "virtual vacation" by leafing through albums of vacation's past to conjure up memories. You may find this "virtual vacation" almost as relaxing as the real thing. Whatever you do, finding a way to recharge on Sunday mornings makes family time that much more special. Smart shortcuts will let you enjoy all the goodness of a homemade treat, and help save precious time for you to spend with your loved ones. Pillsbury® Sweet Rolls are simple place-and-bake morning treats that can be served fresh from the oven, or used as an easy base to many delicious breakfast recipes. They'll think you spent hours in the kitchen, and the best part — you'll have the energy to enjoy breakfast with your family. Convert your kitchen into an art studio. The kitchen is where many Sunday morning memories are made. What better way to get the kids involved than by letting them frost their own cinnamon rolls? Encourage them to get creative by giving them pastry bags filled with icing and fun-shaped tips. Let the cinnamon roll be their canvas as they draw initials, flowers and other designs. Icing a pan of cinnamon rolls may be the sweet spot in your little ones’ Sunday morning. Add your own touch to delicious Pillsbury® Sweet Rolls. -Sprinkle an extra dash of spice such as orange zest, clove or ginger to rolls before baking for a signature flavor. -Set out a warm tub of icing and let the family have fun frosting their own rolls. -Keep a stash of walnuts, candy sprinkles or raisins handy for a special garnish. -Create a breakfast-in-bed tray for your sweetie with flaky cinnamon rolls, orange juice, coffee and the Sunday morning paper. -Bring fresh-baked Pillsbury Grands!® Cinnamon Rolls made with real Cinnabon® cinnamon in a pretty baking pan to your next brunch event. The whole group will love the indulgent treat, and you can leave the pan as a hostess gift. Sunday mornings are a delicious stretch of time to be savored with the special people in your life. 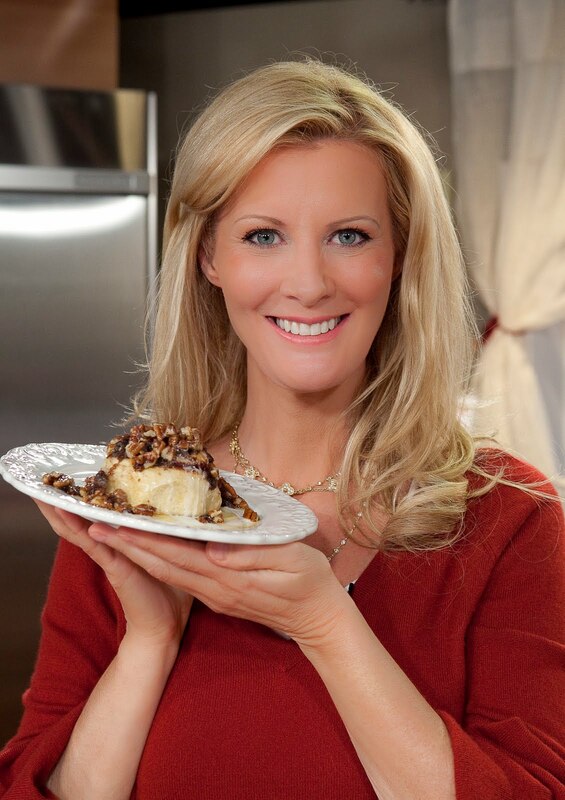 Sandra Lee created some easy recipes using Pillsbury refrigerated cinnamon rolls such as Cinnamon Roll French Toast, Apple Walnut Sticky Buns, and Chocolate Raspberry Cream Cinnamon Rolls. These recipes and more can be found here. 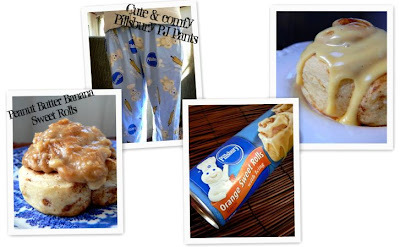 We were given an opportunity to have a wonderful sweet morning with a coupon to try the cinnamon rolls, along with some comfy Pillsbury pajama bottoms, that my daughter snagged from me =) . I bought us some of their orange sweet rolls, and a pack of regular cinnamon rolls to make Sandra's Peanut Butter Banana Cinnamon Sweet Rolls below. This frosting is really good! I like the flavors of peanut butter and banana and using it on a cinnamon rolls, makes them a little more wonderful. Please go check out these other recipes (I'm eyeballing that french toast one), I'm sure you'll find something to make your mornings a little sweeter! In medium bowl, mash banana with a fork. Stir in peanut butter and reserved icing until blended to create a peanut butter dipping sauce. If mixture is too thick, stir in water, 1 teaspoon at a time, until it reaches desired consistency. Spread on warm rolls. I wrote this review for "Mommy? I'm Hungry!" about Pillsbury. I received free product to review and keep as compensation for my honest opinion of the product. All opinions for this review are that of myself & family. Info & stock images provided by PR. Goodness that looks delish! Gotta love Sandra - she is just too precious and she does have some clever tricks and money savers.